I am in love with a place called La Selva Biological Station which is located in the Caribbean lowlands northeast of San Jose, the capital city of the country of Costa Rica. Currently I'm visiting for the second time having "discovered" it last year while I was in Costa Rica for an immersion language school. 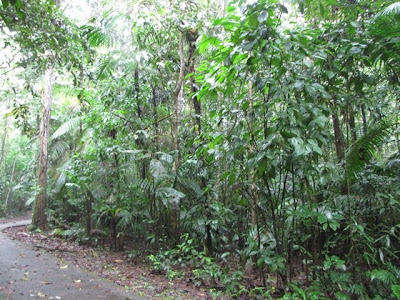 La Selva is covered with tropical pre-montane wet forest which we call rainforest. There is no better place in Costa Rica, and one of few places in the world, to learn about this endangered ecosystem. Species diversity is spectacular, including more than 1,850 species of plants, 350 species of trees, 503 species of birds (there are 886 in the country), and approximately 500 species of ants. The first time I visited last year, I read about the La Selva's Adopt-a-Trail Program. I knew I wanted to be part of it. The funds go directly to La Selva's trail maintenance and environmental education. La Selva gets much needed funding and you get your name on a trail marker. There's no administration fees taken out, your $200 donation does $200 worth of improvement and teaching that will not only affect today and this year, but will provide improvement through generations to come by being able to educate others in the hope of creating a vision within them for preserving our fragile world. We can make a difference whether we can be here or not ... and for those who may never get to a rainforest, it's a tribute to your love for the planet to be part of it. It's a living contribution to the future because our planet's rainforests have a major role to play for the entire earth. For me, it's being a steward of Creation. Last year when I knew I wanted to be part of this, I instantly thought of a marker deep in the jungle, thinking our names out there in a piece of jungle would bring part of the jungle into a piece of my soul even at a great distance away. But, after much pondering, I chose a spot that was in the Leslie Holdridge Arboretum. I felt it represented Genesis in a fashion - "in the beginning, God ..." Think of all the species that God created. His desire was for diversity also and it was created for our enjoyment. Scientifically we now know that it was created to benefit and preserve the planet's atmosphere, which is why it's important to save it. About 75% of La Selva is covered in some of the most pristine old growth tropical rainforest in Costa Rica. 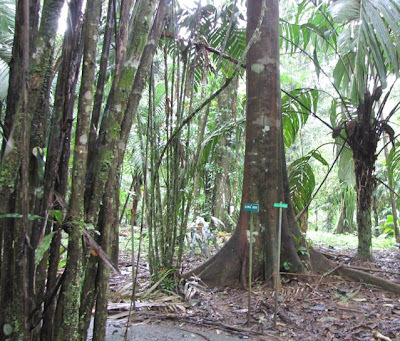 The arboretum is in one of the previous cacao plantations and contains 254 species of trees from all over the reserve. The trees are tagged for easy identification. The purpose of the arboretum is to have an example of all the tree species in La Selva represented in the reserve. This year I figured I'd get my deep jungle location, but was led to choose a marker only 200 meters from the central area, and on one of the two widest trails. It's still dense rainforest, as you can see .. just not deep into the jungle. What it represented to me was 'wide paths for education' because I imagined groups of people whose soul and spirit have been switched on to the importance of preservation and conservation. With education the masses can understand the importance of our tropical rainforests to the entire planet. The Adopt-a-Trail Program is an exciting way to be part of making a difference daily, even when I can't be here to experience it. I have often said that La Selva is my favorite place on all the earth, and I've been blessed to have traveled around the world and to 47 of our United States. There's something mysteriously wonderful at La Selva, and I think it's God's presence amidst a preserved old-growth forest. God is said to have a "still, small voice" so it's a place where it's easy to hear it. The incredible diversity of plant and animal species ... well, it's a little bit like the Garden of Eden ... and in my mind, a vision of what Heaven will be like. Sponsor a piece of salvation for the planet through La Selva's Adopt-a-Trail Program or learn more about La Selva Biological Station.